Have you ever had a cocktail that transcended you to another place? When we were invited to Bar and Block Aldgate for a review of the Sipsmith Cocktails pop up bar, I never dreamed one drink would have such an impact. And it was a cocktail I didn’t even order! Mr Sunny and I reviewed the King’s Cross Bar and Block in the summer. 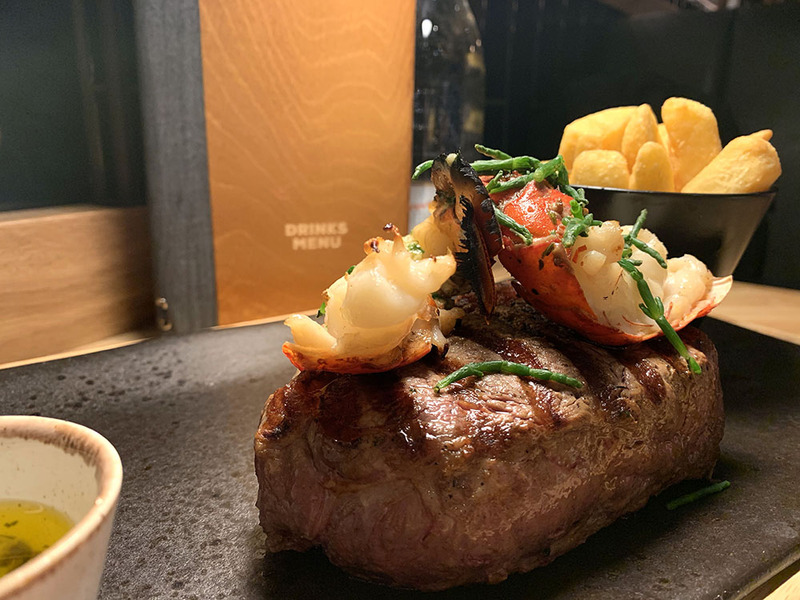 We enjoyed our food but could not say that it made a huge impact on us in comparison to many other restaurants we have had the chance to eat at in London. So, when we had the chance to visit another Bar and Block steakhouse, we kept our expectations reserved. 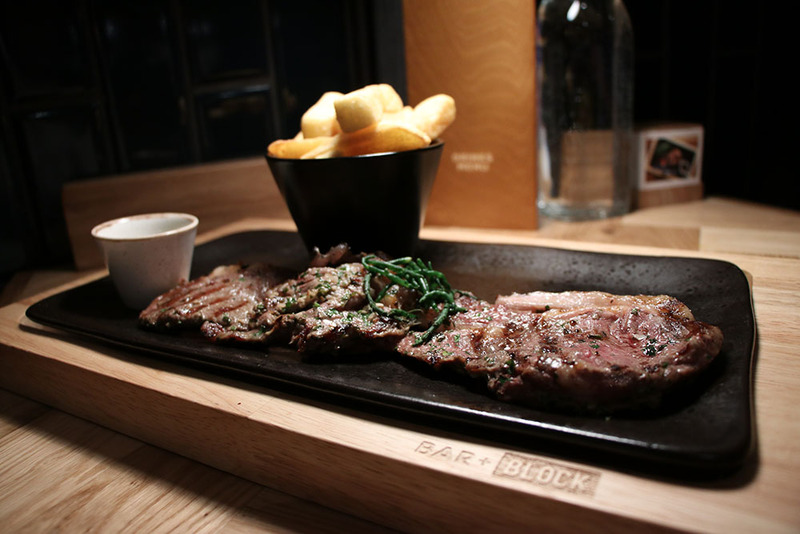 Bar and Block Aldgate was a completely different experience, and we loved it. We arrived early as usual and made a sneaky trip to the bar without telling staff we were there for a review. Mr Sunny and I both had stressful work weeks and just wanted our staple drinks to sip on before we got started. So, he grabbed a beer and red wine for us to to start our weekend unwinding process. Then, we introduced ourselves to the staff and headed to our table. Our invitation was for the purpose of promoting the Sipsmith Hot Gin Cocktails. They offer a seasonal twist on the classic G&T. The Winter Gin Bar serves the ultimate warmers including a Hot Gin & Gingerbread complete with seasonal spices, to the Hot Mulled Sloe Gin with a fruity twist. We reviewed the gin cocktails menu. I chose the Hot Gin and Gingerbread and Mr Sunny picked the Hot Mulled Sloe Gin. I was a little nervous about his selection because I can’t even be around the smell of Mulled Wine. I know it is super popular in London and around Europe for the Christmas season, but it really does not agree with me. Those are the cocktails that arrived. We were nearly certain they mixed up our order because when I saw Mr Sunny’s drink I thought for sure it was mine, and I switched them. So, my first sip was of the cocktail in the foreground. I am not kidding- my immediate response was to think of a ski chalet in France overlooking a mountain during a fresh snowfall. Now, let’s note that this is a view I have never actually had. But, my imagination ignited to this imagery the second I swallowed this drink. We were not that in love with the Gin and Gingerbread. It reminded us a bit of cough medicine. So, throughout our experience, Mr Sunny and I politely battled over the Hot Mulled Sloe Gin. 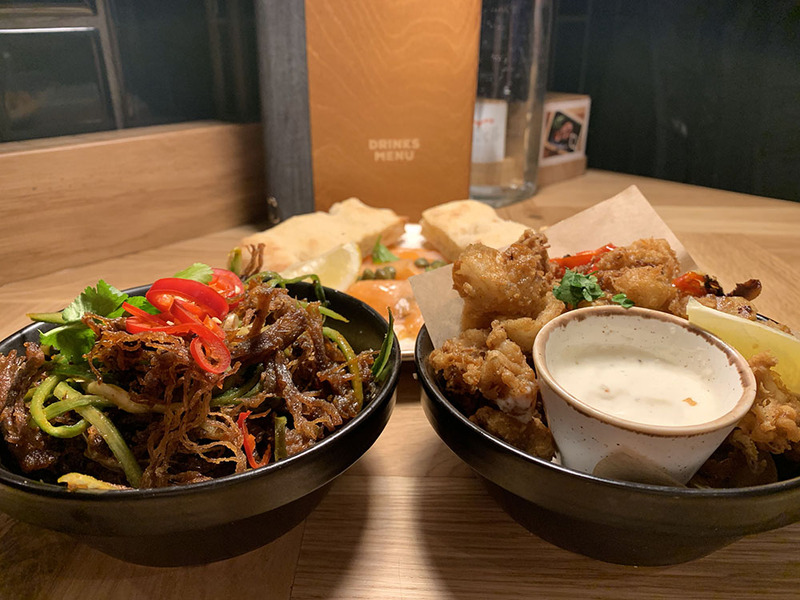 For Starters, we had the Asian Crispy Beef, Salt and Pepper Squid and Smoked Salmon. Each was delicious. The only reason I did not order the Mac and Cheese Bites is because we had them at the King’s Cross location and we wanted new photographs of different food. Next, we both chose steak for our Main courses. It would be silly not to at a steakhouse, right? Mr Sunny ordered the Our Butcher’s Block. Even though he said the actual cut of beef could have been a bit better, for the price it costs he felt it was a damn good piece of beef. Further, he felt it was cooked to perfection. While my Churrasco De Chorizo was not as photogenic as Mr Sunny’s meat, it was a really good course. The flavour was phenomenal, and I would highly recommend it. I thought we should share a dessert, but Mr Sunny wanted to have the restaurant’s feature option, the Chocolate Churros Sundae. We had it at the other Bar and Block location and really enjoyed it. 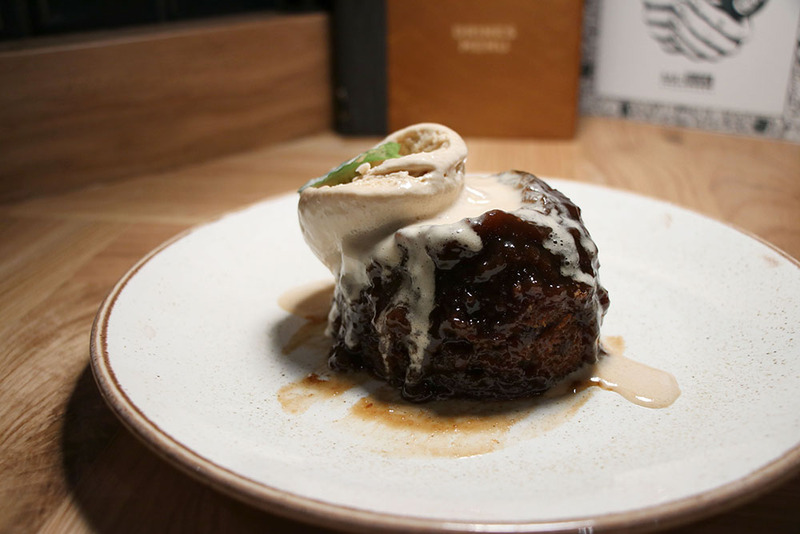 I have a hard time not getting Sticky Toffee Pudding when it is on a menu, so it is what I chose. To say I have no regrets is an understatement. The ice cream was mid drop as I took this photo. It was one of those moments when I wished I had just been a regular person and not a food blogger because I just wanted to dig in and devour it, not snap away on my camera. By the time I was nearly finished with photography, the ice cream had fully landed on the plate. 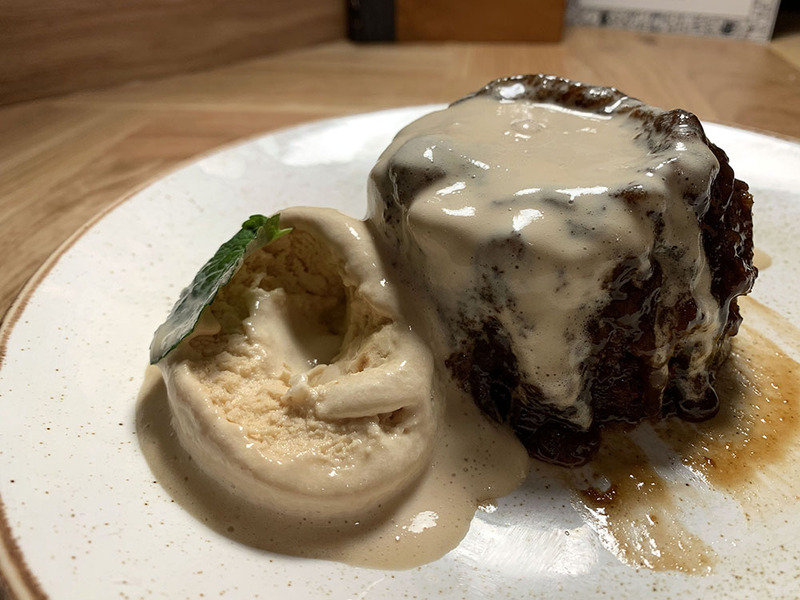 If I could rewind in time, I would have taken a video of the ice cream slowly moving down the sticky toffee because it was quite the sight. Our server’s name was Raees. (I hope I spelled that correctly!) I usually do not mention specific restaurant employees unless they make a big impact. His knowledge of the menu is extensive. He offered excellent suggestions and was extremely attentive and polite. We also liked this location a bit better than King’s Cross because it seemed to attract more of a local clientele. I think it is fair to say that one would assume any restaurant near King’s Cross has a more transient customer. We found Bar and Block Aldgate feel more spacious, although it likely is comparable to the other location. We would really look forward to returning to Bar and Block Aldgate. The one suggestion that I have though is that you enjoy the Sipsmith hot gin cocktails separately from your meal. Although the Hot Mulled Sloe Gin is quite the show stealer, it is not something I would pair with steak. Again, because it presents such a powerful journey when you taste it, I think it is best to isolate the experience from food. Because I truly was captivated by the fact that I enjoyed something ‘mulled’ I searched the internet to see what the drink recipe is. If you are curious, you can read it and perhaps make one yourself. I am curious Sunny friends, have you ever had this experience with a drink? Perhaps tasted something tropical and felt whisked away to an exquisite view in the Maldives? I would love to hear your drink adventures below! Want to know more about London? The Sunny News YouTube channel shares advice for things to do and what you’ll need to know about London. This includes tips for choosing a hotel, how to tip when in London, food to eat in London, and advice for exchanging money. The blog also has a Guide for Americans Visiting London which is a collection of the top experiences I recommend. You’ll definitely want to bookmark it and visit the Pinterest boards created to help trip planning. There is also the Sunny News via email too.